As winter approaches, not quite everyone is looking for a plane ticket south. In fact, some Hamilton residents are specifically adapted to live here throughout the coldest months. The Spruce Grouse is a species found in Hamilton who is committed to living here year round. This grouse is formally known as Falcipennis canadensis, and informally known as the “fool hen,” for its gentle nature and willingness to be near humans. Though initially the Spruce Grouse seems similar to every bird species we are familiar with, it actually has some incredibly interesting adaptations to survive Canadian winters. The spruce grouse lives in the boreal forest, as do almost half of Canadian bird species. Almost 80% of the Spruce Grouse population is found in the Canadian part of the boreal forest, with the rest living in the northern United States. The boreal zone is also home to 3.7 billion people worldwide, meaning that the Spruce Grouse is regularly in the same space as people, though they’re often hidden in the forest and difficult to spot! In the boreal forest, the winters are not mild! Temperature often drop to -30 degrees Celsius. At this point, many birds migrate south because the temperature will greatly reduce their food source, and it is simply uncomfortably cold. However, the Spruce Grouse stays home for the winter. When summer ends, so does the abundance of insects and berries that the grouse normally likes to eat. What could the grouse possibly eat now that everything is frozen? They will spend their time foraging for food and nesting in pine trees, and in fact, they eat the same trees that they live in. Or rather, they eat the needles. Pine needles are very rarely a meal of choice for animals. The needles are low in protein, extremely tough to digest because they’re heavy in cellulose (a very fibrous substance that most animals can not extract any nutrients from), and because they have a very unappealing bitter taste. The spruce grouse can, however, eat these needles thanks to two specific adaptations. One adaptation is an enlarged gizzard, which is the muscular part of a bird’s stomach. In winter, it enlarges by 75% allowing the bird to grind up the needles more finely to aid digestion. Also, like many birds, the grouse will eat small pebbles which enter the gizzard to help break apart the needles. The second adaptation is that the caecum also enlarges. The caecum is a pouch between the small and large intestine that grows by 40% during the cold winter months. This is the part of the digestive system which is best able to digest the cellulose that the needles are made of, and so the grouse have a larger space which provides more opportunity to take nutrients out of the needles. These adaptations are amazing to think about as people - imagine that for half of each year our entire digestive system just grew! This would allow us to live on foods that our bodies certainly can not normally be sustained with. 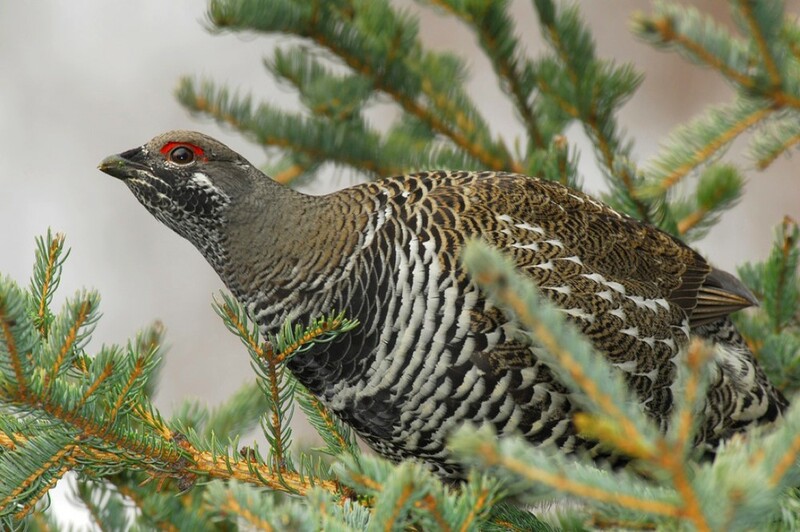 The grouse is an incredible bird, perfectly adapted to living here in the boreal forest year round. This bird is rarely seen in Hamilton, though. It is not a species of concern in Ontario, and is not actually a rare species at all! The grouse just requires additional documentation in Hamilton, specifically. If you’re lucky enough to see a grouse in the Hamilton region, it is requested that you take a photograph, video, or detailed written description, and share it with the Hamilton Naturalists’ Club. More information on how to share this information can be found here. Shannon is a volunteer for BARC, and a McMaster Biology student, passionate about conservation and public education. Find out about the ongoing work to monitor colonial waterbird populations in Hamilton Harbour. See what the Royal Botanical Gardens has in store for Cootes Paradise and Grindstone Marsh over the next couple years.